La Semana de la Ciencia es un evento de ámbito europeo promovido en nuestro territorio por el Ministerio de Ciencia e Innovación y desarrollado por las Comunidades Autónomas. Todos los talleres, “Una Puerta Abierta a la Ciencia” y “Una pregunta para un Científico” cuentan con aforos limitados y se precisa una inscripción previa. Las admisiones se harán por riguroso orden de solicitud de inscripción y posterior aceptación desde la OTRI. Asciende el interés por la física en estudiantes de bachillerato y primeros cursos universitarios gracias a la popularidad alcanzada por la serie de televisión Big Bang Theory. Agradecimientos a Lucas Fernández Seivane por este magnífico post. A cult US sitcom has emerged as the latest factor behind a remarkable resurgence of physics among A-level and university students. The Big Bang Theory, a California-based comedy that follows two young physicists, is being credited with consolidating the growing appetite among teenagers for the once unfashionable subject of physics. Documentaries by Brian Cox have previously been mentioned as galvanising interest in the subject. One pupil, Tom Whitmore, 15, from Brighton, acknowledged that Big Bang Theory had contributed to his decision, with a number of classmates, to consider physics at A-level, and in causing the subject to be regarded as “cool”. “The Big Bang Theory is a great show and it’s definitely made physics more popular. And disputes between classmates now have a new way of being settled: with a game of rock, paper, scissors, lizard, Spock,” he said. 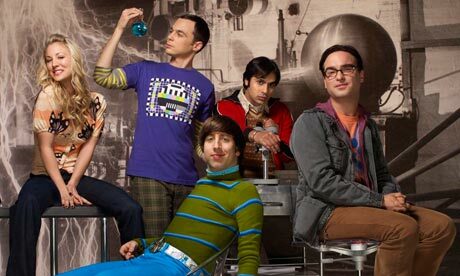 According to the Higher Education Funding Council for England (HEFCE), there was a 10% increase in the number of students accepted to read physics by the university admissons services between 2008-09, when The Big Bang Theory was first broadcast in the UK, and 2010-11. Numbers currently stand at 3,672. Applications for physics courses at university are also up more than 17% on last year. Philip Walker, an HEFCE spokesman, said the recent spate of popular televisions services had been influential but was hard to quantify. The number studying A-level physics has been on the rise for five years, up 20% in that time to around 32,860. Physics is among the top 10 most popular A-level topics for the first time since 2002 – and the government’s target of 35,000 students entering physics A-level by 2014 seems likely to be hit ahead of schedule. It is a far cry from 2005 when physics was officially classified as a “vulnerable” subject. The number of those entered for AS level has also increased, by 27.8% compared with 2009, up from 41,955 to 58,190. The number of girls studying physics AS-level has risen a quarter to 13,540 and of boys by 28.6% to 44,650.